Silo 10 is the duo of Warren Rivera on guitar, synth and effects and James Sidlo (Crevice, Dreamland, Pseudo Buddha, TransCollaboration) on fretless guitar, effects and loops. The name Silo 10 comes from the grain silo outside the Blue Star Art Complex in San Antonio, Texas where the album was recorded. I chucked at the promo sheet saying "Overused references are: Tangerine Dream, Fripp/Eno and Terry Riley". After all, it's hard to escape the analogies that give potential listeners at least some frame of reference. 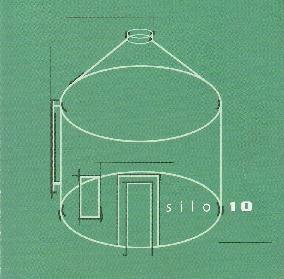 That said, I'll tell you that if you're a fan of Tangerine Dream, Fripp/Eno and Terry Riley then you're pretty well guaranteed to like Silo 10. The album is chock full of slowly rolling guitar and electronic ambient drift, though I hesitate to use the term ambient because this is way beyond ambience. The music gets high volume and mightily intense at several points, while continually evolving and reshaping itself. There's a rock element at times, and I loved the high energy moments that blend the soundscapes with bashing guitar patterns and instrumental wails and screams, all done at high volume. Ambient soundscapes, shoegazer space and cosmic avant-garde space voyages are all the order of the day. And the silo was an excellent choice for a place to record because the howls, rings and pulsations, along with the tones and textures Rivera and Sidlo produce are a large part of what makes Silo 10 such an engaging experience. "Trip" is a standout in this regard. The guitar sounds, textures and effects are simply beautiful. Even the distinct sound of fingers darting across the neck fits neatly into the larger whole. And "Wildlife Crossing" is probably my favorite track, being a sort of soundscape acid freakout piece, with volcanic eruptions, ghostly alien screeches and howls, and gripping, spaced out, edge-of-your-seat intensity. Excellent! If you dig stretched out space voyages with an avant-garde edge then you'll find lots here to enjoy. For more information you can visit the Dogfingers web site at: http://www.dogfingers.com. Visit the Uncle Buzz web site at: http://www.unclebuzz.com.